Like many 20th century immigrant neighborhoods in Vancouver, British Columbia, the city’s Little Germany has been swallowed by the tides of gentrification and high-end boutiques. Once called Robsonstrasse, Robson Street in downtown Vancouver bustled with German merchants who had immigrated to Canada’s West Coast after World War II throughout the 1950s. However, in subsequent decades, many Germans moved out of downtown as residential pricing increased, and settled in Richmond and Burnaby. Now, in the 21st century, most of the delicatessens are gone, and a flaneur strolling in the neighborhood will instead see Armani Exchanges and Gap stores coupled with gourmet sushi restaurants. However, German culture has not altogether disappeared in Vancouver; these days, one can find a taste of it while walking in over half a dozen different neighbourhoods. The much-loved traditional German candy van, Cändy Meister, visits iconic Vancouver neighbourhoods throughout the week. 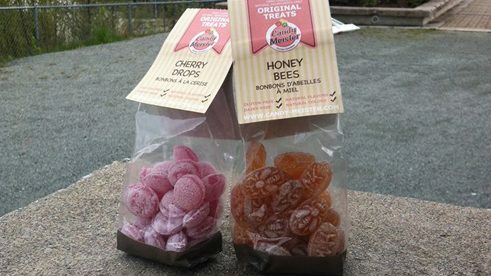 Founded by Berliners Henning Wehke, Max Szelies, and Elisa Köppen in 2012, Cändy Meister brings homemade, all-natural, traditional German candy to its customers. "We get different people wanting candy in different areas," says Wehke. "For instance, people from Dutch and Danish backgrounds love our licorice-flavoured candy. Everybody from Germany knows our raspberry candy because of its shape, and even people from Bulgaria and Sweden recognize it." The traditional candies are calledbonbons, and are commonly sold at the famous German Christmas markets. Although the German bakeries and shoemakers of Robsonstrasse have disappeared with the transformation of the city, German tradition lives on for contemporary Vancouver, coursing from Kitsilano to Commercial Drive in the Cändy Meister van. A leisurely walk down any busy street in the city can bring you a lovely little taste of German flavour. Alessandro Tersigni is a freelance journalist, writer and street artist from Richmond Hill, Ontario.